Will WotC's Next Book "Ghosts of Saltmarsh" Be a Missed Opportunity to Pay Homage to Dave Arneson, Master of Naval D&D Adventures? 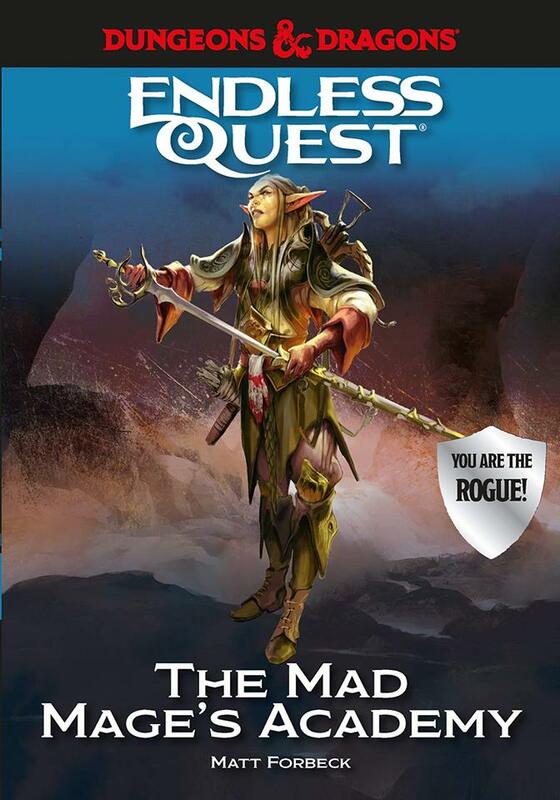 WotC's next release for Dungeons & Dragons now has a cover and a title. 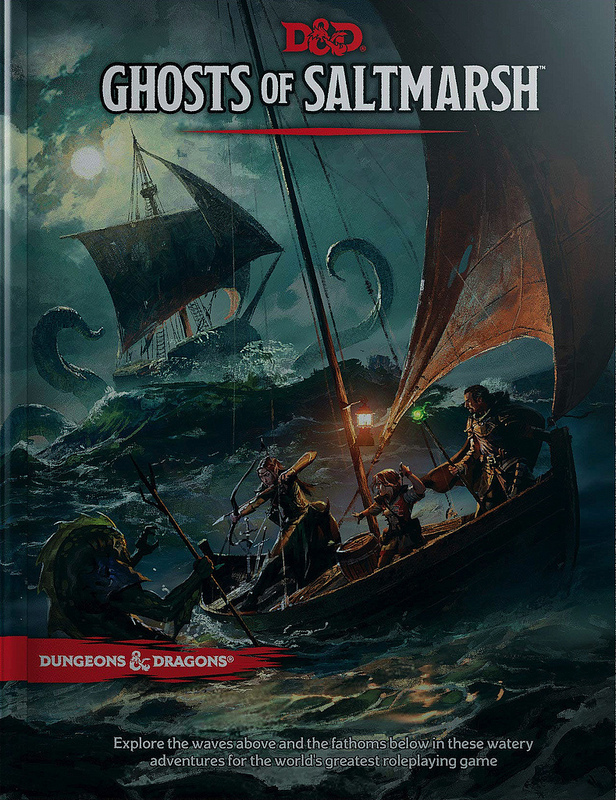 Ghosts of Saltmarsh will feature all kinds of nautical and underwater adventures. While based on the U series, it now looks like Greyhawk references in the book will be limited. It also seems like there will be some Mystara material included in the book. Read more about all of this in this thread at The Piazza. Now there have been many great nautical and undersea adventures in the history of D&D, but there can be no doubt that a pioneer in both these areas of D&D gaming was Dave Arneson. Dave was of course a huge fan of nautical war games. He even co-designed a Napoleonic era naval wargame with Gary Gygax, Don't Give Up The Ship in 1972. Naval adventures played a big part in Dave Arneson's Blackmoor campaign. The First Fantasy Campaign (1977) references several naval battles, including a battle between ships and sea monsters ("Sea monsters won") and the attack on the Black Castle of the Orcs from a ship sailing along the river. Although Dave was not credited for DA4, it seems likely that the adventure across the Black Sea of Blackmoor in that adventure, where the heroes travel on board "The Blossom" under the command of Captain Castagere, must be a reference to Dave's style of gaming. Several Blackmoor adventures also took place on the waterways of the Dismal Swamp, including the epic adventures of Robert the Bald and Captain Krey, where Greg Svenson took on DMing duties for Dave Arneson. Underwater Adventures are also an important feature of Dave Arneson's adventures. Supplement II: Blackmoor (1975) included an entire section dedicated to Underwater Adventures and the supplement introduced many races and monsters that would later becoming iconic underwater D&D creatures. It is not surprised that the D20 Blackmoor line dedicated so much material to the Sahuagin-like race of the Sar-Aigu which tied to the origins of the Dungeons of Castle Blackmoor itself. WotC's return to aquatic adventures presents them with a chance to pay some kind of homage to Dave Arneson, the master of Naval D&D adventures. Will they seize this opportunity? Isle of Dread as an Endless Quest Book from WotC? Endless Quest was the name of the Pick-Your-Own Adventure Path game books that TSR published between 1982 and 1996. It was recently revived for the D&D 5th Edition with a series of books by author Matt Forbeck. Matt recently revealed the covers for two new books in the series that will be published in September this year. Escape from Castle Ravenloft is especially noteworthy because it is the only book so far to be associated with a D&D setting other than the Forgotten Realms. All the books in the series have tie ins to current D&D Adventure Sourcebooks. The Mad Mage's Academy is tied to Waterdeep: Dungeon of the Mad Mage for instance. "You never know, but we’ve stuck mostly to the Forgotten Realms so far. Ravenloft is our first venture outside that." says Matt Forbeck when asked about the possibility of an Isle of Dread tie in book. The question came up because a gigantic hardcover version of the Isle of Dread was released last year. It was published by Goodman Games under lisence, but the previous adventure in that series, Into the Borderlands, is advertised on Wizard's Website. 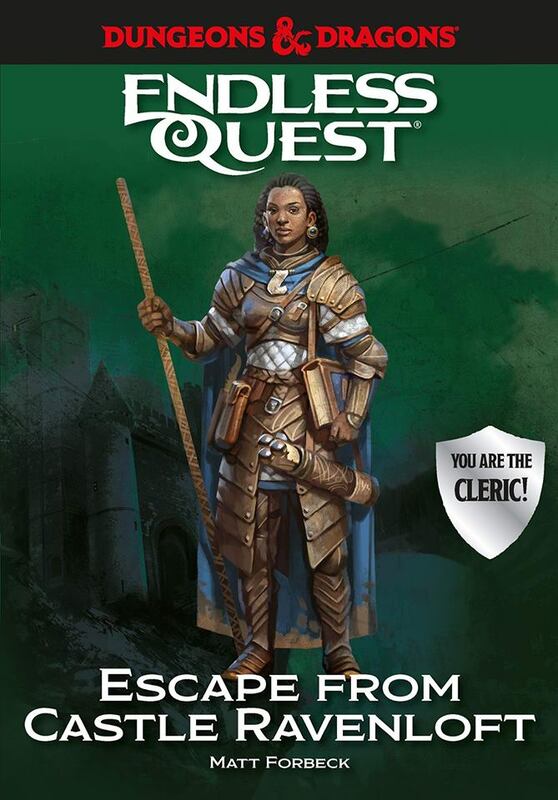 More Isle of Dread material from WotC would make fans of BECMI D&D and fans of Mystara happy. 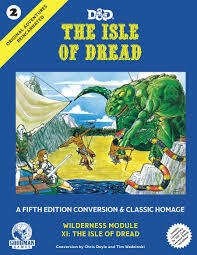 The setting has been teased in numerous D&D5E books, but Isle of Dread is the only book to fully embrace the setting. The Comeback Inn is about to move to a new host provider for the site. This will hopefull go smoothly, but in case you should have any difficulties, feel free to contact me via this blog. We should have everything sorted out by Monday. The forum will remain up and running through this whole time, but in case you experience any glitches, this is why. Over four seasons of D&D adventures, Blackmoor the MMRPG has explored most of the plotlines ever detailed in the setting. It is not surprising that it would also have its own take on perhaps the deadliest of all of the adventure locations from Dave Arneson's campaign. I wrote about the early adventures Dave Arneson ran with the City of the Gods here. 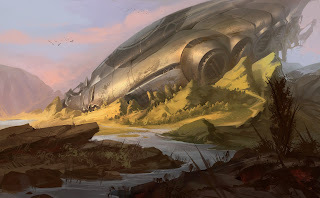 Although hints to the City of the Gods go back to Supplement II's Temple of the Frog and the references to the Valley of the Ancients in the First Fantasy Campaign, this region was first explored in published form with DA3 City of the Gods. When Dave Arneson's company Zeitgeist Games got the lisence to do Blackmoor for Dungeons & Dragons 3rd Edition, they published a new version of the City of the Gods for that edition. The MMPRG also served to promote the Zeitgeist Games product line so it is not surprising that the time would eventually come for the Valley of the Ancients. This way players could bring their charaters from the MMRPG campaign into this famous adventure location. Over at the Comeback Inn, we are soon approaching the re-release of the last episodes of the MMRPG. Episode 90-L is available now as a free download. Go here to download the MMRPG adventure! 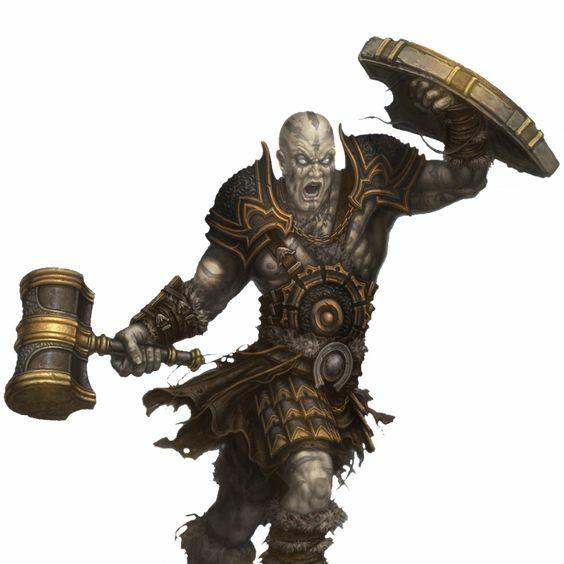 Did D&D Goliath's First Appear in BECMI D&D and Mystara? Goliaths first appeared as a race in D&D in Races of Stone (2004) for D&d 3.5 Edition. They returned as a playable race for D&D 4th Edition and D&D 5th Edition. When D&D 4th Edition launched their version of the Dark Sun setting, the Dark Sun race of Half-Giants was changed into Goliaths. So perhaps it is possible to trace the origins of Goliaths back to those Half-Giants from AD&D 2nd Edition's Dark Sun? Or could its roots be even older? When discussing how to adapt the race to Mystara (which is something we Mystara fans like to do), someone (Cthulhudrew?) pointed out how similar Goliaths were to an obscure D&D monster called Stalwarts. Stalwarts first appeared in AC9 Creature Catalog (1986) for the BECMI D&D edition (sometimes called Red Box, Classic or Basic). Paleologos' excellent discussion at The Piazza about the origin of AC9 monsters has not been able to trace this creature to any earlier product suggesting this is the first apppearance of this race. So, while there is no real evidence of the Goliath being based on the Stalwart, the similarities are remarkable. I like how so many of the monsters, races and classes in later editions of D&D are still the same ones who appeared in the 70s and 80s. And even if these two races are unrelated, I like to think of them as the same thing. Created by fans of the Advanced Fighting Fantasy RPG, this is yet another adventure in the "Blackmoor Living World" series. Credited to The Company of the Maiden, this adventure explores the tomb of an ancient Blackmoor hero. The adventure is set in northern Blackmoor, not far from the City of Maus. Get the adventure for free here. What do you think of this adventure?